Summer is now upon us here in Australia and we are finally being graced with some warm weather! As we jump back into swimsuits it is a reminder that we need to eat a little lighter. The best way to eat lighter is to eat fresh foods with a side of protein and to reduce your fat and carb intake. I generally like to eat really well throughout the week when I am in a more controlled environment like work and home so that on the weekends I can eat whatever I like and really enjoy it. I realised recently that my Fiance and I had got into a bit of a healthy food rut. We were eating such basic healthy food that it was becoming less appealing and the thought of pizzas, snitzels and Thai and take away was more appealing. Both of us being a little tired after work not a lot of thought was going into our night time dishes, well not every night at least and we were eating just simple steak and veg or Tuna salads. As with all foods if you eat them too often they become less desirable and boring so I could tell… we needed to spice things up a little! Yesterday I decided I needed to reinvigorate my tastebuds and passion for healthy foods so I popped down to the market in my lunch break and picked up some things to accompany the very boring selection of mixed leaves, cucumber and tomato on my fridge. What do I like eating when I am out? I LOVE salads when I am out so why am I not making these yummy salads at home?? I Love roast beetroot, pumpkin and pine nut salads, rocket pear and balsamic, waldorf salads with walnuts, apple and blue cheese, greek salads with chicken and mint and of course haloumi salad! 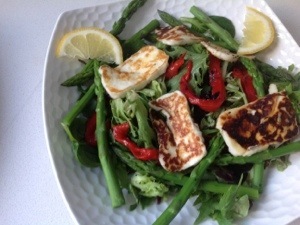 I grabbed some Haloumi, asparagus and marinated red capsicum at the shops. I topped the leaves with some blanched asparagus, red onion, roast capsicum and some Haloumi I fried in the frying pan till it was gold on the outside and soft in the middle. I dressed the salad with lemon juice and olive oil and salt and pepper and there you go.. a really yummy salad that I made in 10 minutes that was restaurant quality and healthy . If you were quite hungry you could add some chicken or chick peas to it just to add in some protein but mine was fine without!! Now that summer is back I am going to try and eat at least 4 big salads a week, I am experimenting with some new flavours tonight so I will let you know how I go! !